Today we are in Fiesse, a strip of land situated on the boundary with Cremona and Mantua and the last town in the province of Brescia. 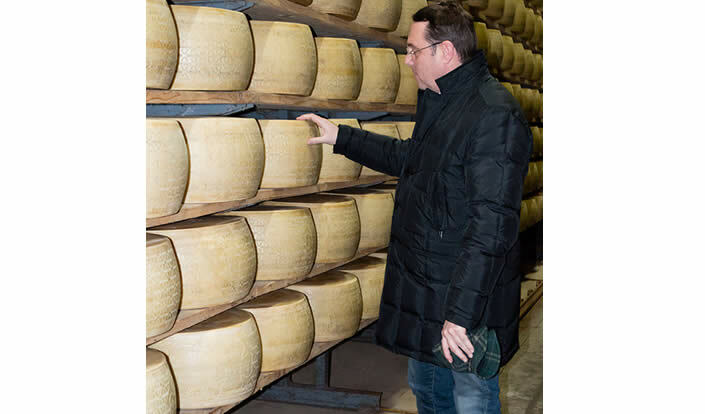 We meet Giuseppe Santus, who tells us that the Scala dairy was established in 1890 by his great-grandfather Angelo Scala. 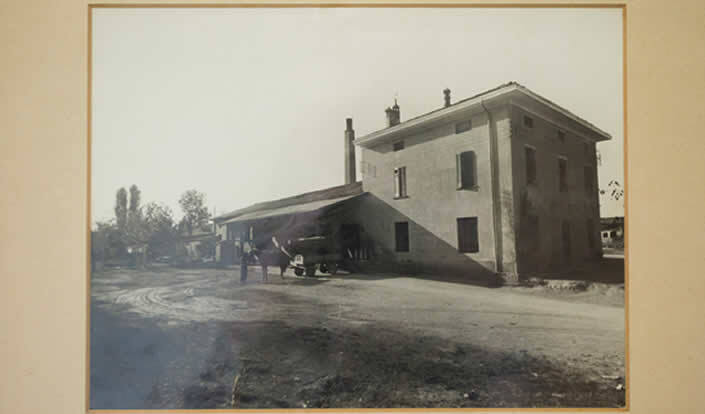 Since then, the dairy has expanded its activities thanks to his grandfather Giovanni Battista, who managed to pass on his passion for the work and the business to his four daughters as well. It was my grandfather who introduced Grana Padano production, and he was also one of the founders of the Protection Consortium. 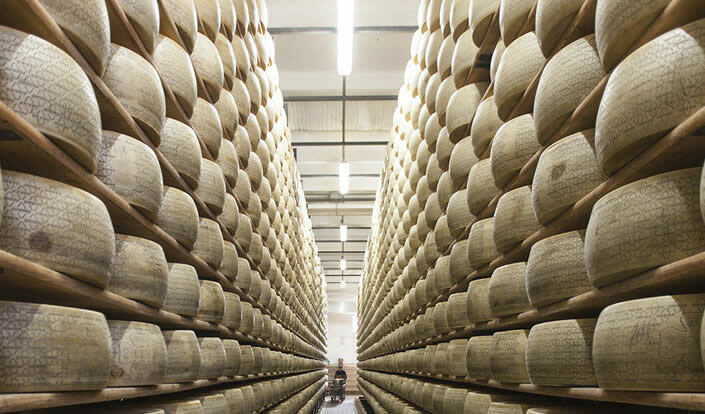 Initially the dairy also made Fontina, for as long as it was legally permitted, as well as Gorgonzola and Provolone, but eventually it decided to focus exclusively on the production of Grana Padano. 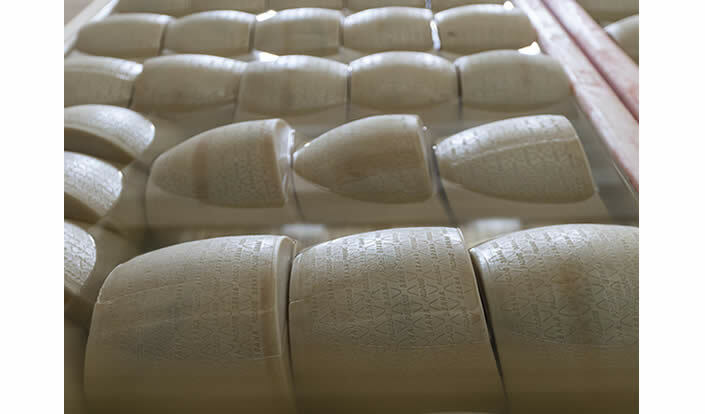 I joined the company after my grandfather died; I was 21 and had just completed my degree in Economics and Business Administration, so I dedicated myself entirely to the company as well as the Grana Padano Protection Consortium! Cheese is made here 7 days a week and 365 days a year, and production has never stopped, not even during the summer, when the quantity is reduced but a minimum level of production is always maintained. Particular attention is duly paid to the quality of the milk and to its various processing stages. Giuseppe points out that in order to have good quality milk, it is important for the herds to be well looked after and be fed the proper diet so that they will produce the right kind of milk, in strict compliance with production specifications. Priority is always given to the intrinsic quality of the milk, sometimes even at the expense of quantity. Only the milk produced by certain dairy farms is selected so as to obtain high quality starter whey, which is also regularly analysed to always make sure that a good product is being used, a key factor for the cheese to be a success! Until the 90s, the storehouses were located near the family home. Then, following a fire, the company decided to expand the facility and the whole section of the plant allocated to brining and cheese storage was extended. In 2000, the cheese-making room was renovated and fitted with automated equipment. But despite the drive towards technology, we are very keen to keep traditions unchanged, in strict compliance with regulations and with particular attention to quality. A special thanks to Giuseppe, the Consortium’s senior deputy chairman, for the originality and fun he always brings to the office, and the great passion he has always shown for our cheese.